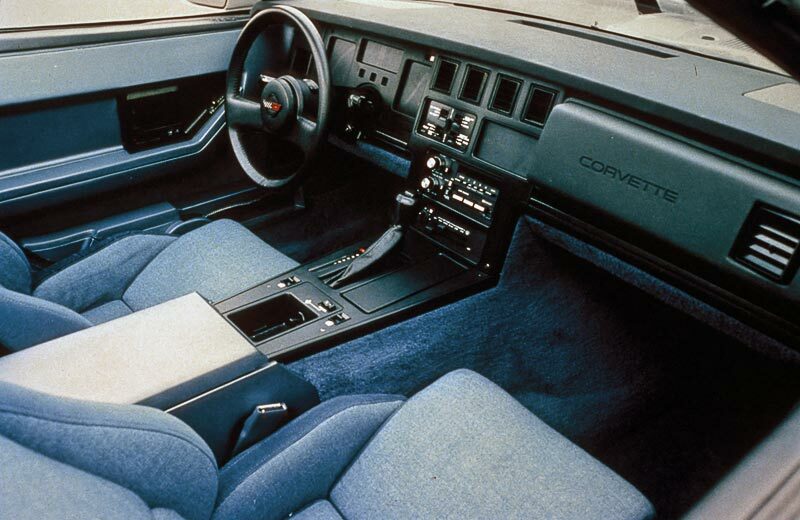 No detail was overlooked when it came to making the 1984 Corvette the best ever. The C3 had featured hide-away headlights, but they were a flip up design, so the top of the headlight was the same whether it was up or down. 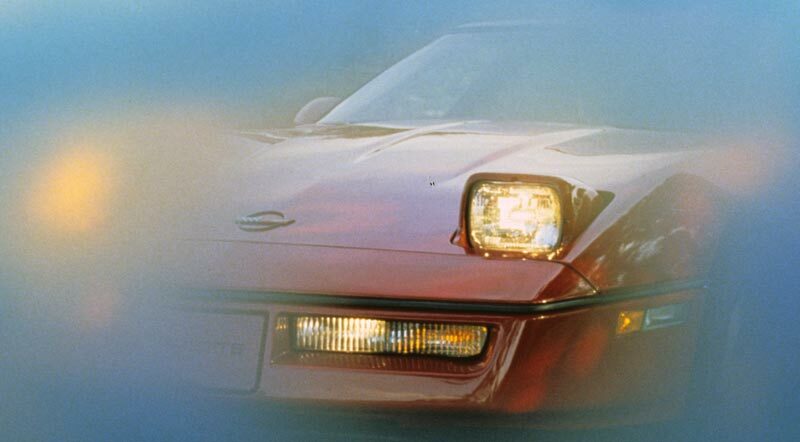 The C4 differed in that its hidden headlight rotated when activated. so in effect the top became the bottom. The result was that a very unaerodynamic lip present in the functioning C3 light package was a nicely smoothed and aerodynamically friendly edge in the C4. 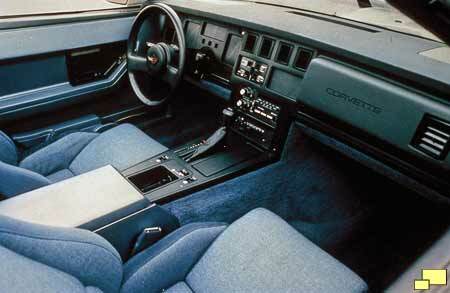 The interior of the C4 was all new and like the chassis, incorporated some innovative features. There was a fair amount of room especially when compared to the C3, although the driver and passenger did feel isolated by the prominent center tunnel. Rather obvious for the passenger is the large lump thing called the "breadloaf" because of its shape. At the time it was anticipated that federal regulations would include a safety impact for the passenger, not unlike the collapsable steering column in front of the driver. The breadloaf was designed to meet this requirement which ultimately did not materialize. Cloth seats (above) were standard and leather was an option (RPO A09; $400.00). Cloth sports seats (RPO AQ9; $625.00) were available later in the model year and included an adjustable lumbar support and power controls. The instrument panel (below) was all electronic and advanced for 1984. Both the speedometer and tachometer consisted of bar graphs in addition to numerical readouts. This was especially useful with the tachometer as the graph took on the shape of the power engine's power curve. The idea was that the driver could quickly determine if they were using engine revs in the desired area of the power band. The whole panel was quite colorful and in the words of one enthusiast, "looked like the lights of Tokyo". The speedometer graph (the left portion of the panel) only went up to 85 mph, in accordance with government regulations of the time. Oddly enough, the numerical readout was not similarly limited. A fair amount (remember, this is 1984) of information was available, including fuel level, oil pressure, oil and coolant temperature, and battery voltage. A computer calculated and presented instant and average miles per gallon as well as fuel range figures. A switch setting determined if the oil pressure, oil and coolant temperature, odometer, speedometer readings were metric or english units. It was however a complicated affair with reliability problems; reports indicate that many instrument panels had to be replaced at considerable cost. In the 1980s customers of just about all cars were removing the factory sound system and installing better performing aftermarket units. Chevrolet answered the challenge with a partnership with Bose, a well respected home audio manufacturer. The Delco-Bose (RPO UU8; $895.00) unit was custom designed for the C4 Corvette and featured innovations such as amplifiers at each of the four speaker locations, a noise reduction system for both the radio and cassette tapes, true electronic tuning and speaker enclosures designed for the Corvette interior. 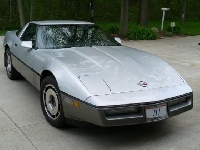 Everyone agreed that the system produced excellent sound and despite the high price was installed on the majority of 1984 Corvettes. 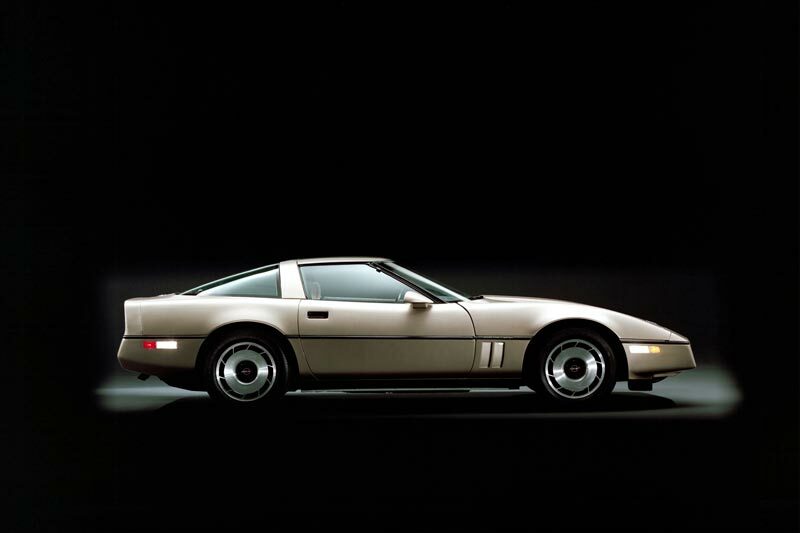 1984 Corvette: Official GM Photo.